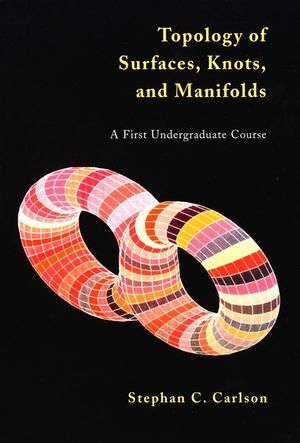 Topology of Surfaces, Knots, and Manifolds offers an intuition-based and example-driven approach to the basic ideas and problems involving manifolds, particularly one- and two-dimensional manifolds. A blend of examples and exercises leads the reader to anticipate general definitions and theorems concerning curves, surfaces, knots, and links-the objects of interest in the appealing set of mathematical ideas known as "rubber sheet geometry." The result is a text that is accessible to a broad range of undergraduate students, yet still provides solid coverage of the mathematics underlying these topics. Stephan C. Carlson is the author of Topology of Surfaces, Knots, and Manifolds, published by Wiley. A student-friendly writing style provides a clear exposition of concepts. Mathematical results are presented accurately and main definitions, theorems, and remarks are clearly highlighted for easy reference. Carefully selected exercises, some of which require hands-on work or computer-aided visualization, reinforce the understanding of concepts or further develop ideas. Extensive use of illustrations helps the students develop an intuitive understanding of the material. Frequent historical references chronicle the development of the subject and highlight connections between topology and other areas of mathematics. Chapter summary sections offer a review of each chapter's topics and a transitional look forward to the next chapter.